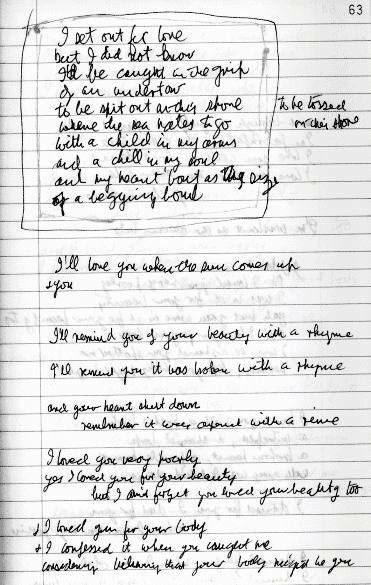 I just was reading scans of Leonard's manuscript of Closing Time on The Essential site, and there, in the midst of Closing Time variations and versions, on page 63 of the notebook, Leonard wrote first version of Undertow! He clearly framed it with pencil and wrote "to be tossed in the shore", separating those lyrics from Closing Time, as another song. Last edited by tomsakic on Wed Jun 01, 2005 2:27 pm, edited 1 time in total. I agree. And without ( and ), or course. I think Marie transcribed all pages from the scans... I noticed few places where I'd read something different than she did. There are many unclear places, with question marks also. Anyway, I believe all such opinions would be appreciate by Marie. I'd take note about this and tell her. Also, "to be tossed on this shore" isn't his notion/title/remark as I thought, but he wrote it in the level of line "to be spit out on this shore", so it's actually variation of that line. He sips some coffee from a cup with the logo of The Future on it, beside him the thick notebooks where poems hundreds of verses long will get condensed, often, into a single six-verse song. Around us, as we sit, almost nothing else except a bottle of Sparkletts water, a few candles, a toothbrush, and, tucked into a light switch, a picture of the Winged Victory. Cohen has not slept, most likely, for six days. "It's driven us to art," he says, returning to his theme of the Other. "I mean, it's so perplexing, the humiliations, the glories that are so abundant, and it's such a dangerous undertaking. I was just looking through my notebooks, and I saw something nice. It was: 'I set out for love, but I did not know I'd be caught in the grip of an undertow. To be swept to a shore, where the sea needs to go, with a child in my arms, and a chill in my soul, and my heart the size of a begging-bowl.'" I wonder have any of Leonard's songs (with the stated exception of Sisters of Mercy) NOT had an immensely long and involved gestation? This thread was fascinating stuff, for an LC nerd. And I just saw this thread for the first time . It was started whilst I was still pretty much incommunicado here, starting the first of January, 2005 and ending after my return from Hydra in late June. I'd given up on 'catch-up,' but it looks like I need to restart with that; just one thread at a time is better than nothing. This one's priceless, including Pico Iyer's segment. I love reading his words. I recently came across something else in a magazine by him. That is so exciting, seeing how Leonard's mind just went a wholly different direction, yet so concisely, in the midst of "Closing Time." I start wondering things like whether he suddenly got a flash of a more literal, closing time, one brought about by the sea. For the word "on," the "o" is in a more 'closed' position, rather than being 'open' and rounded in the middle of it; the "n" has a much smaller, down-slanting line for the left side of the "n," with a more normal, longer, down-slanting line for the right side of it. For the word "this," Leonard's "t" is crossed above it, rather than across it, and it runs at a downward-to-the-left angle into the "n" of "on." All of that is to say that I agree with you, YdF [these things need to be 'justified' ]. Plus, I also was interested to see how/if I was able to describe in words the structure of his letters [I think I managed ]. I'm believing, of course, that Marie was long ago advised of all this . You must have been thrilled to just be reading along and come upon this, Tom ! Good on you !!! Very cool . Did you suddenly feel like you were at the river panning for gold and found yourself blinded by the brightness of the huge nugget you just found ?